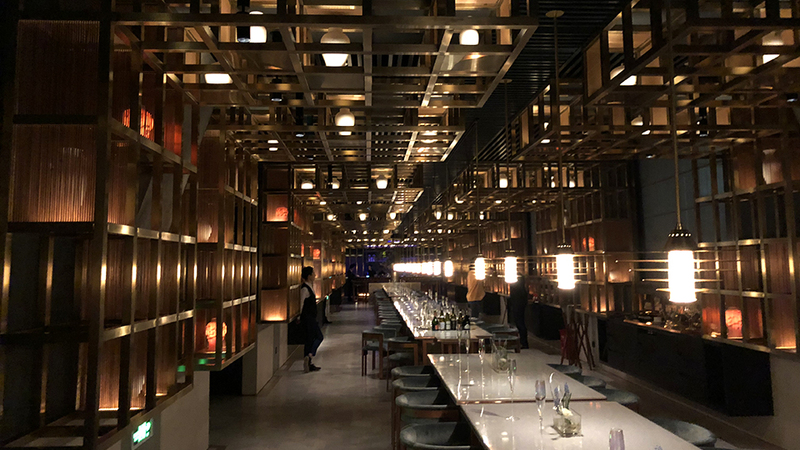 The Peacock Room is a beautiful new restaurant in Shanghai that offers high quality, precise Sichuan cuisine in a remarkably supercool, sleek and modernist setting. Traveling practically non-stop has its drawbacks. For example, I was in my apartment in Rome only one and a half days in the whole month of March. Believe me, that it is absolutely not a way to live. Then again, working as a wine writer and having a Chinese girlfriend who lives in her home country doesn’t exactly leave much of a choice. However, all that traveling does mean that, besides getting to see her (which is great), I get to eat out a lot (which is also great). Happily, I love to eat and drink, which helps make all the airports, train stations, cars, delays, traffic and long hours on the road more bearable – not by much, but it does help. 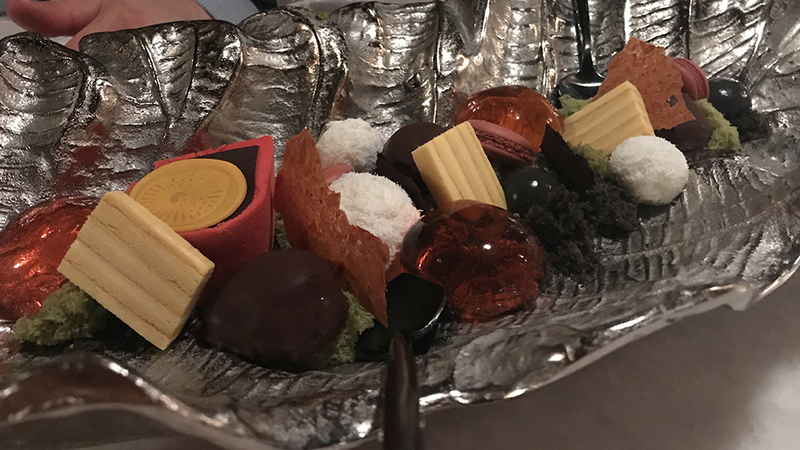 When I am fortunate enough to come across a really delightful new dining destination, then it actually becomes a whole lot more bearable. So, it is with Shanghai’s brand new The Peacock Room, a restaurant that was recommended to me by two very knowledgeable Chinese friends. 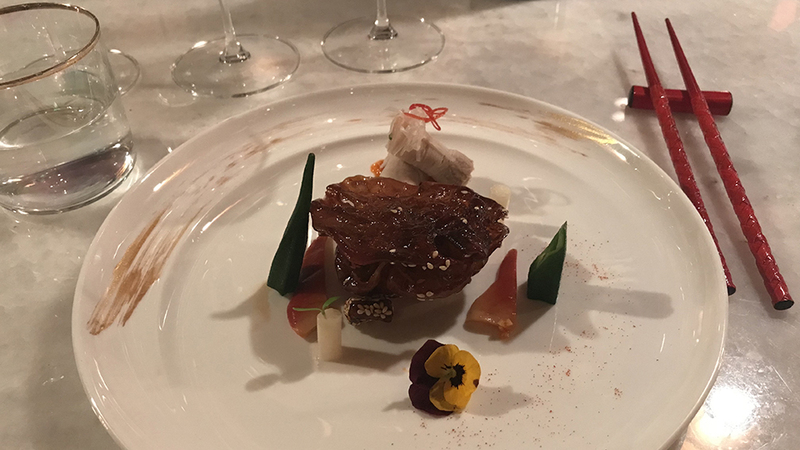 Although The Peacock Room is housed in a large cream-colored modern building that is not much to write home about, the restaurant itself is stunningly beautiful, impossibly hip, cool and sleek. Design credits go to Caesar Song, owner of the Yu Ba Xian restaurants, and Andy Hall of MQ Studios (who also designed The Nest and The Cannery, among many other restaurants). The featured cuisine is from China’s southwestern Sichuan province, and can get quite spicy in some dishes (as it should), so beware. On this night, two set menus were offered, although guests can mix and match items from the two menus. 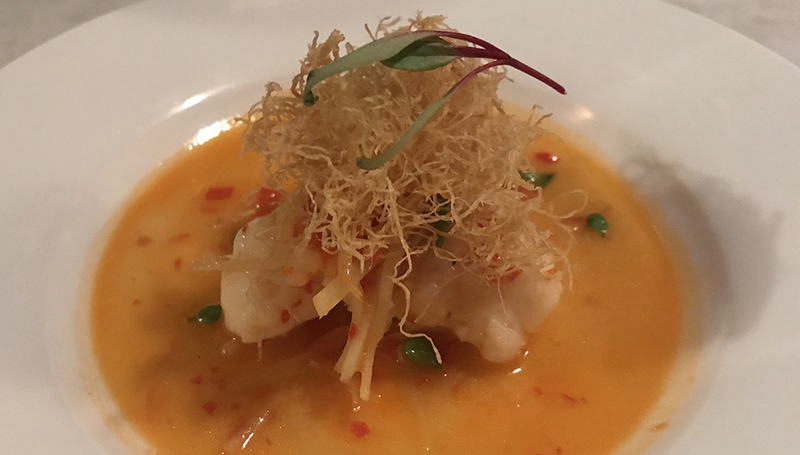 Not all the dishes at The Peacock Room are intended to faithfully replicate traditional Sichuan recipes. The many modern flourishes that characterize these dishes are mostly well thought out and add something to each one. Chef Sam Zhang, who is of Malay origin, really does bring an extra dimension to many of the dishes you’ll try here. n any case, this is Sichuanese and Sichuanese-inspired food like you’ll rarely try anywhere else. 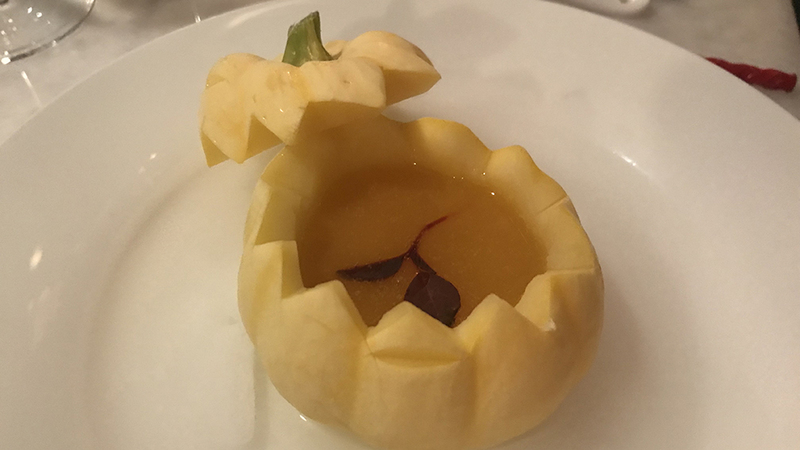 Much of what tasted, including the traditional spicy and sour crispy beef, the braised lobster with ginger and spicy sauce, and a very pristine, delicate crab and pumpkin soup served directly in a small pumpkin was memorable. The wine list at The Peacock Room is outstanding, in fact one of the best I have seen in the city, with plenty of interesting, intelligent choices. The 2006 Taittinger Comtes de Champagne Rosé is at once rich and refined, a simply fabulous Champagne Rosè I won’t soon forget. Intensely perfumed, with the Pinot Noir-derived red berry and cranberry flavors that are not just concentrated, but also remarkably pure. It is one of the better Rosé bubbles I have had in the last year. The 2015 Domaine de l’Ecu Muscadet Sèvre et Maine Granite is an icon to many wine lovers. Domaine de l’Ecu has been certified organic since 1972 and converted to biodynamic practices in 1998. The 2015 showcases terroir remarkably well, as do the other different versions of Muscadet wine, such as Gneiss and Orthogneiss bottlings, which are made from totally different soils. These wines age sur-lie for 15-18 months and deliver a layered complexity that is unlike that of other Muscadets, but clearly, an attraction to strong earthy, savory character in white wines is necessary to fully appreciate what Domaine de l’Ecu does so well. The 2015 Oremus Tokaji Dry Mandolas is a typical modern dry Furmint with notes of peach, apricot, lemon curd, herbs and caramel. This lovely wine, made by the Vega Sicilia-owned Oremus estate in Hungary’s Tokaj-Hegyalja, features a bright savory quality that allows it to match well with some elements of Sichuan cuisine, especially those dishes that are more delicately spicy). 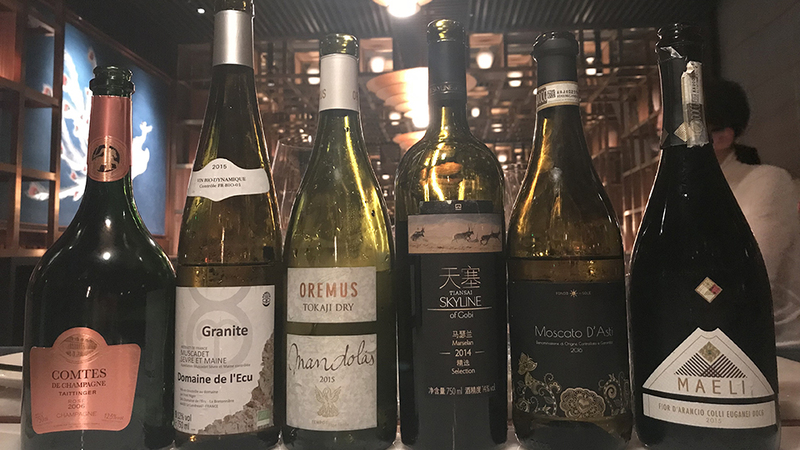 Chinese wines have come a long way in a short time. Although some Chinese wine enthusiasts still tend to be easily impressed by the prestigious names – in the world of wine, that would be Cabernet Sauvignon, planted everywhere in the country but with very dubious if not downright poor results) the fact is that the country actually makes some increasingly good wines from the likes of Marselan and Cabernet Gernischt, which is better known as Carmenère elsewhere in the world. Those who know and have followed my writing over the years know of my love of grape varieties and work devoted to them, and not just in Italy. Marselan is a little-known French grape variety that was developed by INRA researcher Paul Truel in 1961 by crossing Cabernet Sauvignon and Grenache in the town of Marseillan (and hence the variety’s name). Grown mostly in France’s Languedoc (though there are plantings elsewhere, such as in Northern California), Marselan has taken remarkably well to some Chinese wine production areas. The 2015 Tiansai Vineyards Marselan Skyline of Gobi is yet another good example of just how successful Marselan can be in China. This version by Tiansai Vineyards (located high up in China’s Xinjiang, an autonomous region in the country’s northwest) is unfortunately over-oaked, with the much too sweet oak-derived vanilla, coffee, coconut and caramel notes overpowering the rich black and blue fruit aromas and flavors. Palate-fatigue is unavoidable, but there’s enough purity in the fruit easy to recognize that the wine only needs to be handled a little more gently. Certainly, there is potential here. Tiansai Vineyards was one of China’s first wineries to be certified organic by Chinese authorities and in July 2014 was named the country's “model company for wine-grape planting” by the Chinese Wine Industry Association. The 2015 Maeli Spumante Moscato Fior d’Arancio Colli Euganei is an extremely successful wine that speaks clearly of Moscato Giallo, showcasing the variety’s typical candied citrus peel and pungent yellow flower notes well, combining these with a clean, savory mouthfeel and long finish. By contrast, the 2015 Fondo del Sole Moscato d’Asti (a wine made with a different Muscat variety, Moscato Bianco) lacked both depth and freshness. 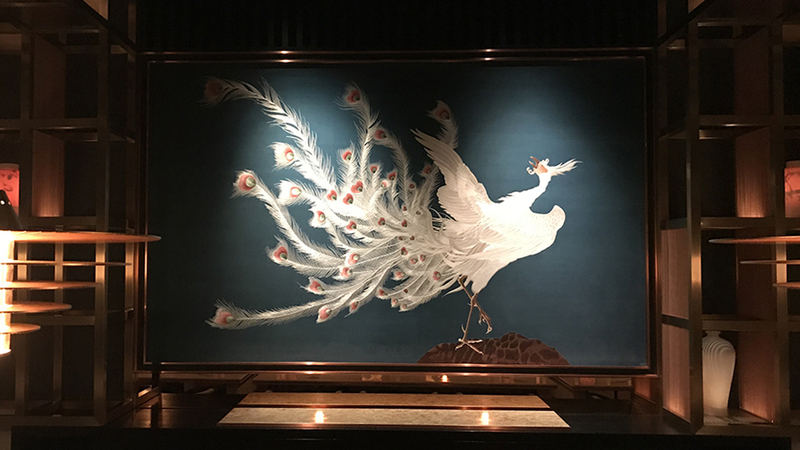 Readers traveling to Shanghai should make a point of checking out The Peacock Room for a high-quality meal in an elegant environment. The food is really quite good and the wine list is top notch. Dining-wise, visitors can certainly do worse in the bustling, sprawling, beautiful city that is Shanghai.